【Properties】 This product is brown or brown red clear liquid. 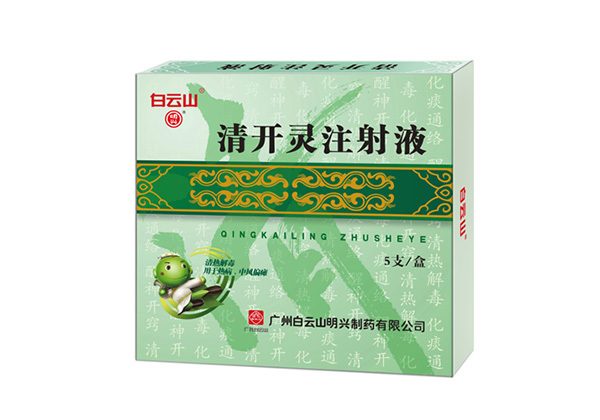 【Indications】 Qingrejiedu, phlegm collaterals, wake up resuscitation. For fever, Shen Shen, stroke hemiplegia, confusion; acute hepatitis, upper respiratory tract infection, pneumonia, cerebral thrombosis, cerebral hemorrhage seen in the above syndromes. 【Dosage】Intramuscular injection, 2 ~ 4 ml on the 1st. Severe patients intravenously, on the 1st 20 ~ 40ml (2 to 4 days a day) to 10% glucose injection 200ml or sodium chloride injection 100ml diluted before use. 【Adverse reactions】This product occasional drug dermatitis, allergic asthma, gastrointestinal reactions, flushing, itching, local pain, laryngeal edema, allergic shock, nervous system reactions, infusion reactions. (1) a table card cold fever, drug allergy history with caution. (2) during the medication if allergic reactions should be promptly discontinued and desensitization. The first 30 minutes before treatment, the patient must be closely monitored, such as allergies and other adverse reactions should be promptly discontinued and desensitization treatment. (3) This product may not be used if it is precipitated or cloudy. If transfusion diluted, appear cloudy or use. (4) taboo compatibility of infusion of high glucose maintenance solution, compound sodium lactate glucose injection. (5) Qing Kai Ling injection should be used in the temporary preparation, must be completed within 4 hours of instillation. (6) infusion speed: Note drip speed not fast, children to 20 to 40 drops / minute, adults to 40 to 60 drops / minute is appropriate. (7) If the condition requires, and some should not be compatible with the drug combination, the liquid and infusion should be immediately replaced, to prevent the two drugs mixed in the blood compatibility reaction, and extend the two kinds of drug interval infusion time, or available physiology Saline or other fluids separate the two drugs apart, not at the same time. 【Storage】 airtight (10 ~ 30 ℃).